Queen of everything and Princess of quite a lot! Of course she should live in a castle. 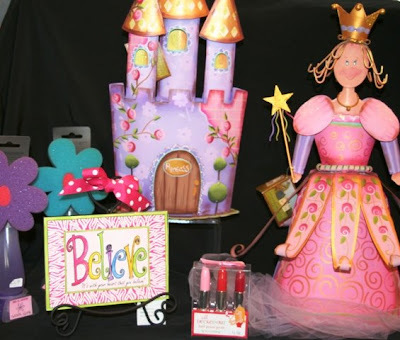 Enchant the birthday girl's party entrance and welcome guests with metal princess and castle . Use included stake for entrance welcome or easel back for party theme centerpiece. After the party, create her fairy tale room. Just a few Party gifts for girls: Flower Power bath gel wand or lipstick pens!